Father’s Day is this Sunday. Are you ready? 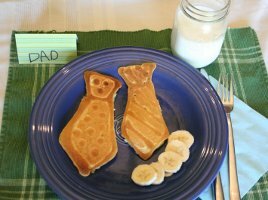 If you still have to make something for your dad, check out one of these fun ideas from around the web. Neckties are a big theme this year, so I hope your dad wears ties! 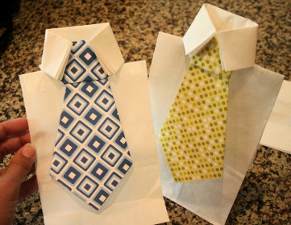 How to Fold a Father’s Day Tie Napkin from Better Homes and Gardens. In this eBook, explore a collection of Father’s Day crafts designed by craft bloggers. 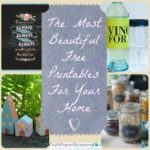 You will find easy sewing crafts, paper crafts and thrifty crafts using items from around the house. You will even find a few food-themed craft projects for Dad! Learn more and download the free eBook here. Thank you for sharing your ideas and continuing to inspire us! 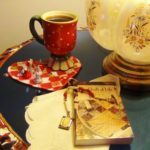 Special Father’s Day Giveaway- Win One of Three Books! In honor of Father’s Day, we have a special giveaway for you! Win one of three Father’s Day craft books, just by answering the Monthly Craft Question, “What is your favorite DIY gift idea for Dad?” Any of these three craft books would make a great gift for a creative Dad or someone looking to make gifts for Dad all year round. 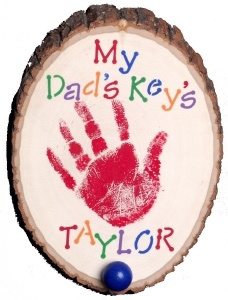 Visit the Father’s Day Crafts category at FaveCrafts. Select your favorite Father’s Day project. 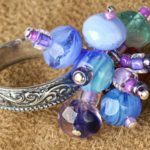 Include the title of your favorite craft project in a comment on this blog post. Tell us your favorite original DIY idea for Father’s Day. We want to hear about your homemade gift idea! You are welcome to link to a blog post with your answer. We will select three winners next Thursday and contact them for a mailing address. Good luck! The winners will be receiving emails! This weekend is chock full of events at my household. Not only for father’s day, but my brother’s birthday is Friday. As you can imagine, that’s a lot of manly celebrations over a three-day time span. Of course, with two big events happening over a summer weekends, that only means one thing in my family: grilling. If the weather holds up, we will be spending all weekend celebrating outside. To prepare, we have been making various grilling crafts over the past week. For the actual grilling aspect, my family and I have crafted two different types of skewers, a beaded barbeque skewer and a red, white and blue BBQ skewer. The best part about the skewers is that we can use them all summer long, and the red, white and blue skewer is perfect for our upcoming July 4th cookout. In order to keep everything organized outside, we utilized this great outdoor organization craft from blogger Rachel Griffith. Barbecue can get really messy, especially when my father digs in to some grilled cut of meat slathered in barbecue sauce. To make sure he stays clean, we crafted him a bib and a beaded bib leash. Hopefully our celebration plans are as successful as our crafts have been so far. We weren’t kidding, Jennifer Priest really is scrapbook royalty! 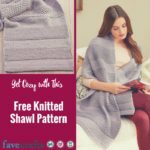 She has her own adorable blog, which you can check out here, and she also works for Scrapbook Royalty, a crafty charitable organization that we LOVE here at FaveCrafts. 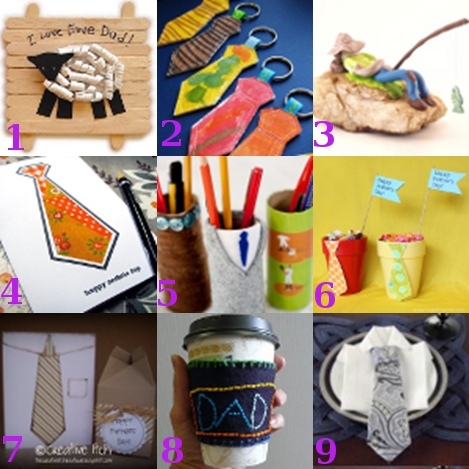 Here are a few of Jennifers creative DIY Father’s Day gift ideas for you last minute folks. A great way to celebrate Dad and what he means in our lives is to create a mini book about just that. I collected quotes I found online that pertain to my children’s experience with their dad, my husband. Then I gathered photos that represented those things in my children’s lives. I used scraps of fabric that my husband liked as well as an old pair of his jeans that I cut into accents to use in the book. I taught this book as a sold out Prima Certified class at two local scrapbook stores in southern California. You can download a PDF of the quotes here. Ink – Ranger, Colorbox, Stampin’ Up! Book Plates, Brads, Photo Turns – Stampin’ Up! I recently purchased some nut medleys packaged in brown cardboard tubes from Starbuck’s. My family already ate all of the goodies inside but I loved the shape and color of the sturdy tubes. You can “recycle” almost any packaging into something new. Fill Starbuck’s Frappucino jars, Prima flower bottles, and other packaging with candies or treats from your local grocery’s bulk candy and nut selection. My husband loves mixed nuts so I plan to fill this tube with a variety of flavored mixed nuts from our local market. This makes a great gift for any occasion, especially Father’s Day for a little extra treat. Save the leftover can as a decoration or desk organizer! For the full project, click here. 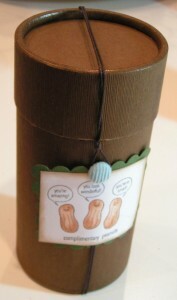 Check out FaveCrafts.com for more fun Father’s Day craft ideas. 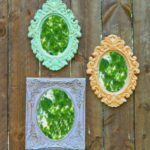 Instead of joking about the stereotypical Fathers Day Tie, why not celebrate this icon of the holiday with some of these fun Fathers Day projects and ideas?! These gift bags are inexpensive, easy, and fun to make. Use them for Father’s Day or for a gift for another special man in your life. I just used white standard-sized paper lunch bags. Click here for the full project instructions. 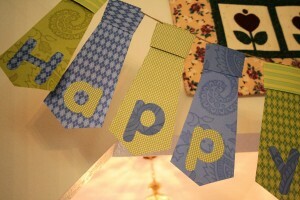 Greet Dad Sunday morning with this fun tie banner. I made mine out of coordinating scrapbook paper. I made a pattern out of tag board, and could get three ties out of each 12×12 piece of paper. I printed out letters from the computer and used the old window-as-a-light box trick to trace them onto the scrapbook paper. (A Cricut or similar machine would be nice, here!) I cut out the letters then glued one on to each tie. I then folded the ties over a piece of twine and stapled them to secure them. 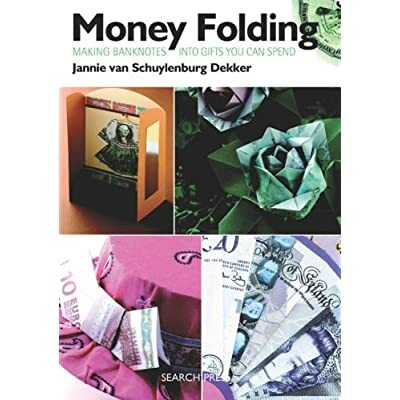 I cut bands of paper and folded them to look like the knot at the top of a tie and glued them on the backside so they would stick out a little in the front and give a bit of a 3D feel. I’m hoping to take care of the banner and be able to use it for several Fathers’ Days. You might consider making the banner out of fabric or even old ties from thrift shop or Dad’s closet. Fix Dad a special breakfast. Use the bottle technique I blogged about here to make tie shaped pancakes. You could make the ties Polka dotted by adding blueberries or chocolate chips, like I did to my ghost pancakes, here. 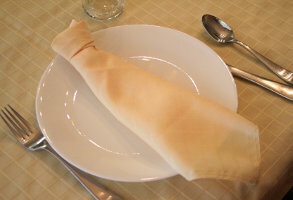 Fix Dad his favorite dinner, and dress-up the table with this great napkin fold. I found the directions here , but simplified the process by choosing not to iron the folds and letting them be a little less stiff (and much quicker). You could take this tie thing a step further and make a tie-shaped cake, or tie shaped sugar cookies. The basic tie shape is simple enough that you could cut the shape out of the sugar cookie dough with a knife, if you don’t have a cookie cutter. I was also planning to try a tie shaped cake, utilizing one of the corners of a square or a rectangular-shaped pan to be the corner of my tie and cutting away the sides. Drizzled chocolate or white chocolate across the top of the cake would give a tie pattern that Dad would be excited to eat. Check back at My Insanity Blog, because when I find the cool Father’s Day Tie card I made, I will post it there. Happy Father’s Day to all of the wonderful men out there who have chosen to be Dads! Let’s show them how much we love them! 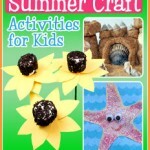 For more great Father’s Day gift ideas, check out our craft projects at FaveCrafts.com! Cards for Dad- Help Me Choose! My Dad is completely impossible to buy presents for. He generally buys himself any new gadgets he wants and he is incredibly picky when it comes to clothing. Aren’t all Dads hard to buy for? Luckily, my Dad loves to read. I’m talking about 3-4 books/week. As the daughter with the graduate degree in English, I’ve made it something of a tradition to buy him a book at Christmas, Father’s Day and his birthday. Since that eliminates some of the creativity of gift-giving, I try to make him a homemade card and something else small to include with the book. For my Dad’s past birthday, I sent him a crochet tawashi. Tawashis are seriously fun to crochet. 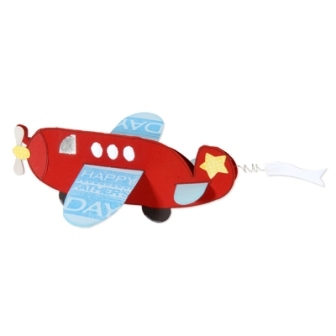 Airplane Card for Dad– This 3-D Father’s Day card is an airplane, which he can keep on this desk. How cool! 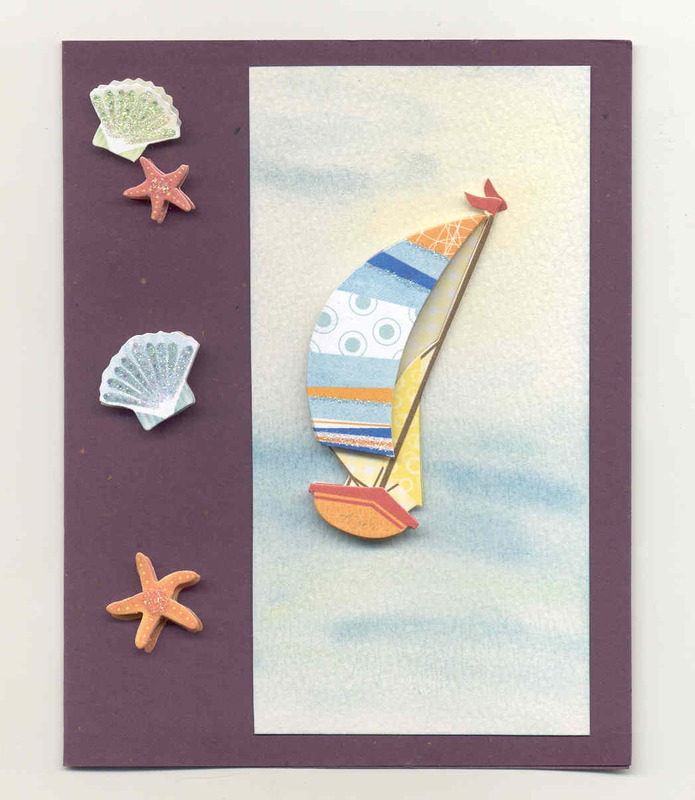 Summer Breeze Card– My Dad loves sailboats and this homemade card is really lovely. 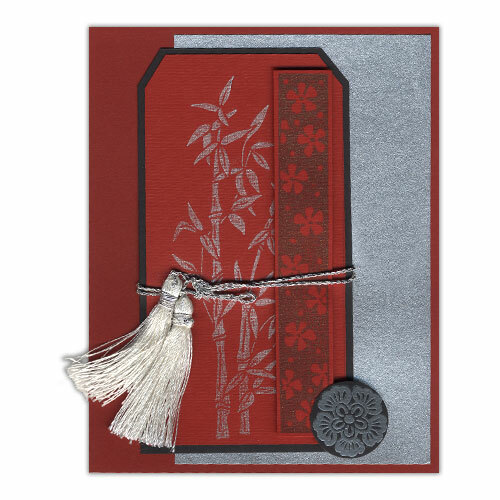 Everything Japanese Card– My Dad also loves all things Japanese, so I’m sure he’d like this card. Decisions, decisions. Which should I make? Marie-Jolie of Permission to Unwind sent over two patterns for a Rugged Camper Cooking Set. You don’t often see good masculine knitting patterns like these! Included in the set is a heat-resistant wool-mitt with leather handle and a panhandle cover or cozy. 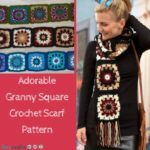 These thrifty gifts can be knit in a variety of leftover yarns from your stash and are easy patterns for beginners. Knit the set for Father’s Day or an upcoming birthday! Father’s Day is coming up, which means many people are looking for gifts for that special guy in their lives. Little kids look up to their dad because he is their hero. Wives look at their husbands because they are the most amazing men in their lives. And men look at their dads because that’s the person who taught him how to be a man. The most precious gift a child can give a parent is hand print. Although you might not know what to do with it for the time being, you can always look back at it and realize how fast your child is growing. It’ll make you remember the good times you had with your child and how much they’ve learned throughout the years. The key hook for dad is a great craft. Not only does it have your child’s hand-print on it, but you can also put your keys on it. Many people lose their keys, so this is a good way to stay organized. 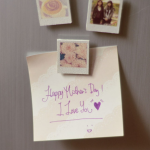 Find that special gift and make it one to remember. Happy Father’s Day!